Prepare to be amazed by the world’s strongest connection! What does this mean for you? It means connector with a unique structure that allows the cord to stretch up to six times its original length without twisting. Surf with confidence knowing that the structural strength copies that of nature so it’s flexible and strong at the same time. POD Ware has taken an invaluable piece of surfing equipment and made it even better with an advanced leash connection that won’t over spin the swivel connector. Enjoy maximum strength, maximum stretch and a safe, easy ride! 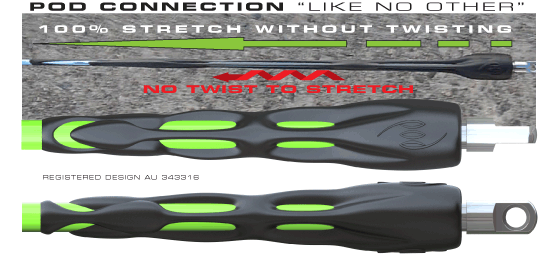 Ankle Strap POD Connection: Enables the urethane cord to protrude further away from the surfer’s feet and over the surfboard. Leg Rope Connectors: The highest grade urethane combined with the unique POD Connectors enables both to stretch to the utmost specification limits of the raw materials providing maximum durability. Webbing Loop: Quick release in moments of need.